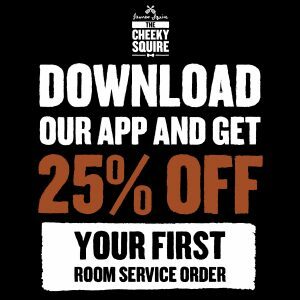 The Cheeky Squire is located in Melbourne’s bayside suburb of Frankston. This seaside accommodation, in the heart of Frankston’s CBD, is only a two minute walk to the beach, shops, cafes and a very short walk to the cinema, supermarket and train station. Our 11 newly renovated motel rooms feature a flat screen TV, free Wi-Fi, air conditioning, fridge, and tea/coffee facilities. There are two room types available, catering for leisure and corporate needs. Although all rooms are on the ground level, all accommodation rooms are accessed via a small set of stairs and are not wheelchair accessible. The Studio Queen & Single room has premium King Koil beds including a queen and a king single in each. The rooms include ensuite bathroom with walk in shower as well as all modern conveniences. The 1 Bedroom apartment room has premium King Koil beds including two queens and a fold out sofa bed. The room includes ensuite bathroom with walk-in shower, lounge and dining table. The Kitchen includes generous work space, microwave, a full sized fridge and is equipped with basic kitchen utensils.